Above: Australian Federal Police (CCPB) Pipe Band: They performed at the Edinburgh Tattoo in 2008 to great acclaim, and have been invited and shall attend this year’s Edinburgh Tattoo, (August 3-25, 2012). This will be the 62nd extravaganza to be staged at the Scottish capital's ancient Edinburgh Castle. The Avalon Tattoo, through twelve months of hard work by Avalon Sub-branch President, Commodore Graham Sloper RAN Rtd. and the Sub-branch of the Avalon Beach RSL, brings together our community and every generation to enjoy and gain insight into our Defence forces. Each year one of our Defence Services is the focus of the Avalon Tattoo, although all are represented. This year it was the turn of the Air Force. 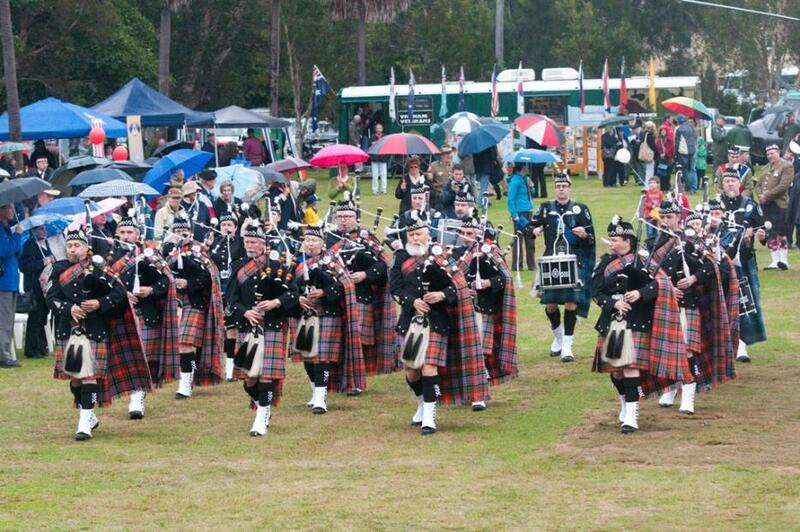 A full day of festivities that included a street Parade, local bands as well as the wonderful music of traditional Pipe and Drum outfits, some travelling from Brisbane to participate, great displays from the Pittwater Motor Enthusiasts, and even a Rescue simulator from Broken Bay Marine Rescue which was a hit with the children, kept visitors quite happy despite a steady rain. Air Force year brought highlights of the Roulettes solo display, the Huey Iroquois Helicopter UH-1H , courtesy of the generous Patrick Soars of Australian Native Landscapes who again brought in Australian Vietnam Veterans and a special passenger, Hon. Bronwyn Bishop, the Pitts S1 Glider Pilot Simulator and a very cute puppy named 'Avanti' of the Air Force Fire Service. Patrick Soars with Hon. Bronwyn Bishop. The Freedom of Entry was exercised by 305 SQN AAFC yesterday. This 2012 observance of an ancient tradition involves the practice of conferring the Freedom of Entry upon military units, allowing them the privilege to march into the city "with drums beating, colours flying, and bayonets fixed". This ceremony stems from ancient Rome and was re-instigated during the Middle Ages when independent companies of armed men were maintained by land owning nobles. As our towns grew into cities, and town councils became the governing authorities, formed bodies of troops were not allowed to march through a borough without seeking the permission of the governing council. Pittwater's Mayor, Cr. Harvey Rose and Inspector Nigel Taylor, representing the Chief of Navy, granted the Freedom of Entry. A Commemoration Service, recognising the June 18th 1940 speech by General Charles de Gaulle, which galvanised occupied France and is cited as the origin of the French Resistance, took place at the cenotaph outside Avalon RSL. The 2012 Avalon Tattoo had a steady rain all day which kept everyone damp but could not dampen the spirits of those who contributed, participated or attended this wonderful community event. A Pittwater celebration of Military Music, which is, as Major General Brereton so rightly stated in his address, is of fundamental importance to our community and society. Tattoos celebrate our heritage, invest our culture with a richness that music provides and this, as with all music, communicates unity. Taking the salute from the assembled Cadets this year, Her Excellency Professor Marie Bashir AC CVO, also gave those assembled a keynote as to what spending a day learning more about our Defence Service peoples gives to those who attend.
" I ...felt elated and inspired by what we saw today and in particular where we glimpse the future of Australia in our young people. We must not cease to nurture them and be glad that they are embracing those values and traditions. It's not vainglory or wearing a uniform, it's an Australian tradition of caring for one another that is being handed down for as long as this country has existed. Commodore Graham Sloper RAN Rtd., Superintendent Doreen Cruickshank and Insp. Nigel Taylor. Photographs by Michael Mannington of Volunteer Photography. and A J Guesdon - Report A J Guesdon.